DALLASWhen the children were released from the privately run immigration detention facility in Karnes City, Texas, they were immediately taken to the emergency room with pneumonia. Over the past few months, several children who fled from violence in South and Central America with their mothers have been hospitalized after leaving the facility run by GEO Group, a private prison company that saw its stocks jump following Election Day. The childrens health problems were the result of poor medical care inside what is essentially a prison for mothers and their children, according to Amy Fischer of the Refugee and Immigrant Center for Education and Legal Services. A GEO Group spokesperson denied the claim, saying all children are given chest X-rays upon admission to the facility. The spokesman also said that not everyone is given X-rays when leaving Karnes City unless they seem to be ailing. With Donald Trump now president-elect, the Karnes City facility and a dozen more like it across the country are preparing to fill even more beds with immigrants and refugees. 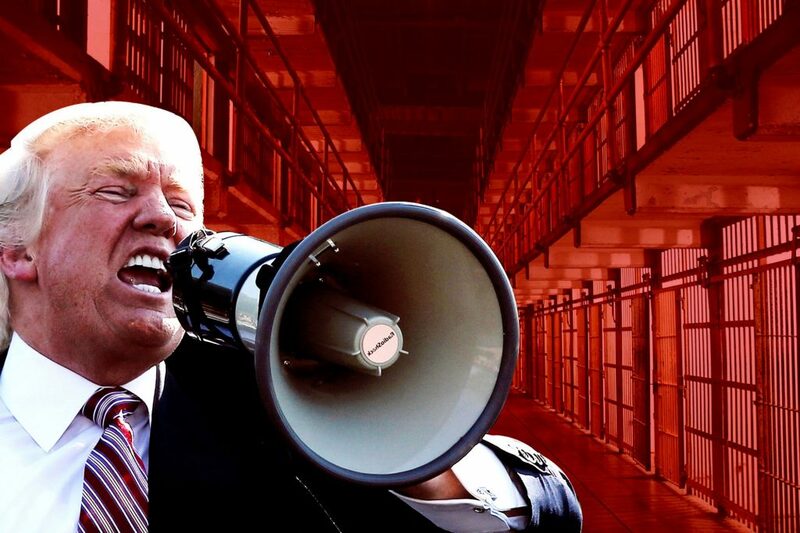 GEO Group and another private prison company, Corrections Corporation of America, are also preparing for more large, lucrative contracts with the federal government to run the detention centers. Both companies saw their stock prices soar following Trumps historic and shocking win. If we see how the stocks skyrocketed, I think they see this as a huge opportunity for profit, Fischer said of the two companies. Of the 1,000 largest companies in the country, Forbes reported the day after Trumps victory, the biggest winner of the election was Corrections Corporation of America. CCAs stock shot up 49 percent that day thanks to Trumps promise to enact mass deportations as president. GEOs stock rose 21 percent the same day. But it isnt just the two companies who have an interest in detaining more immigrants. A report released Thursday shows that some of the countrys largest banks profit off fees and interest payments from the two companiesboth of which rely on such debt financing for their daily operations. The report (PDF), compiled by In the Public Interest, which describes itself as a comprehensive research and policy center, shows the two companies have nearly $2 billion in debt each from lenders including JP Morgan Chase, Wells Fargo, and Bank of America. Without them, GEO Group and CCA would have difficulty operating, according to the report. In the Public Interest calls for the banks to immediately halt debt financing to GEO Group and CCA. If the banks did so, the companies will be forced to find other sources of funds, which would significantly reduce their operations and growth. Some of those operations include significant donations to Republican lawmakers in Congress, many of whom have harsh stances on crime and immigration, according to Fischer. You can trace their campaign contributions to some of the most aggressive anti-immigrant politicians both at the state and federal level, Fischer said. Those contributions are in addition to the millions both companies spent on lobbying politicians between 2004 and 2014, according to a 2015 report from the liberal Center for American Progress. For its part, CCA says it makes a point not to lobby for specific criminal justice laws. It is CoreCivic [CCA]s longstanding policy not to draft, lobby for, promote or in any way take a position on proposals, policies or legislation that determine the basis or duration of an individuals incarceration or detention, spokesman Jonathan Burns told International Business Times this week. On top of helping to fund its daily operations, large loans from banks have helped GEO Group and CCA to purchase smaller corrections companies, the report notes, allowing them to become the two largest private prison companies in the country. Under Trump, they may have the opportunity to grow even larger. In June the president-elect told MSNBCs Chris Matthews that privatization of prisons seems to work a lot better. The comment came two months before the Department of Justice, citing security problems and poor conditions at private prisons nationwide, said it would phase out the use of private companies to run federal penal institutions. Whether Trump still believes private prisons are superior to those run by the government is unknown, but GEO Group and CCA have the president-elects comments on immigration to lift their spiritsand, possibly, their bottom line. In a 60 Minutes interview on Sunday, Trump pledged to deport between 2 and 3 million immigrants, making it a priority to remove those with criminal records. Whether there even are that many who fall into that category is a matter of debate, to put it charitably. If there are that many criminal illegal aliens, Trump would have to make good on his campaign promise of creating a deportation force to remove thema promise House Speaker Paul Ryan assured the American public last week was only lip service. Illegal immigrants with criminal records are an easy target for deportation, but the immigration plan on Trumps website makes no distinction for men, women, and children fleeing violent countries like El Salvador, where some 4,000 people had been murdered by October, according to The Washington Post. Anyone who crosses the border illegally will be detained until they are removed out of our country, Trumps official immigration policy statement reads. Whether Trump intends to kick out the tens of thousands of refugees fleeing South and Central American violence remains to be seen, but what is clear is that GEO Group and CCA see Trumps win as a boon for business. As you know, the need for new infrastructure has been frequently discussed during this election season, CCA CEO Damion Hininger said in a November call with investors just before the election. And (CCA) is positioned to assist government organizations in making investments to modernize their mission-critical criminal justice infrastructure, while allowing them to maintain their borrowing capacity to address other capital needs. In laymans terms, were about to get paid. The call came after U.S. Immigrations and Customs Enforcement renewed a contract with CCA in October to operate the South Texas Family Residential Center in Dilley, Texas, a $1 billion dollar deal that runs through 2020. Prior to the contract renewal, the companys future was grimstock prices dove following the August Justice Department decree that called for the end of private companies running federal prisons. Partly in response, CCA changed its name to CoreCivic and, in the November call with investors, Hininger said the rebranding was part of an effort to change the company into a diversified government solutions provider. The name change had nothing to do with problems at CCA-run facilities, like the deadly 2015 gang fight at an Oklahoma prison that left four men dead, Hininger said. Despite poorly sourced claims from industry critics and activists to the contrary, our continued focus on operational excellence, flexibility, and our compelling value proposition have continued to create opportunities for the company to grow where our partners need and want solutions that we can deliver, Hininger said during the call. Except Trumps pledge may be difficult to meet, a brief look at federal data shows. It has taken President Obama six years to deport 2.5 million people, according to a 2015 Department of Homeland Security report. Last year, DHS, ICE, and Customs and Border Patrol deported less than 1 million people combined. More than 30,000 of those men, women, and children were from South and Central America, according to the report, and at least 40,000 more such refugees are currently being held in private detention centers like the ones in Karnes City and Dilley, Fischer said. That number is expected to increase, as the renewed contract for the Dilley facility indicates. Along with an expected increase in detentions will come a greater burden on an already overworked system in which credible fear interviews are held. There, DHS hears arguments from refugees who say a return to their home country would put them at risk of injury or death. Unfortunately, theres no right to counsel in these proceedings, so what we do is prep the mothers as much as we can ahead of these interviews, Fischer said. In Karnes City, a family facility that holds mostly mothers and their children, Fischer and other advocates have a high success rateroughly 90 percent of refugees there are granted the right to stay in the United States and eventually seek citizenship. In official terms, their fear is credible. Now, they have a new fear: President Trump. I think the immigrant community is right to be very scared, Fischer said. At the same time, its an expansive system and I dont think Trump has really thought through the intricacies of what it would take to deport the amount of people he has mentioned. If Trumps words are to be trusted, no one currently in a detention facility or caught crossing the border illegally after Jan. 20 will have the opportunity to prove they have a credible fear of returning to their home country. As we look forward to a Trump presidency we expect this to only be more aggressive, Fischer said.